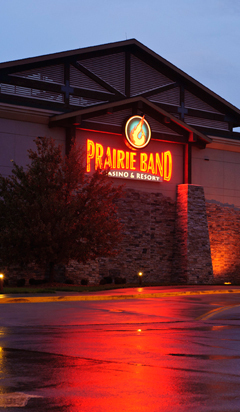 The Prairie Band Potawatomi Casino and Resort is owned and operated by the Prairie Band Potawatomi Nation. The casino entertainment complex encompasses approximately 63,000 square feet, and features over 1000 slot machines, many table games, a Longhouse Buffet, Gift Shop, Buffalo Grill, and the Three Fires Steakhouse. Adjoining the facility is a 297-room hotel with a beautiful courtyard and two relaxing hot tubs and convention center which includes 1,000, 4,000, 8,000 or 12,000 square feet meeting rooms available with full catering and banquet facilities. Prairie Band Casino is located in the southeastern quadrant of the reservation at the junction of Highway 75 and Road 150. The casino is approximately 15 miles north of Topeka, Kansas. The Casino employs approximately 700 people and operates 24 hours a day. Approximately 120 tribal members are employed at the casino. The Nation uses revenue to repurchase national lands within reservation boundaries, providing national and community employment, improving infrastructure, strengthening national programs, funding education, and improving the quality of life for all members of the nation. The goal has been to generate enough money to compensate for the inequalities of the past. It is a time to not forget the past but to build upon it, providing a solid foundation for the reservation’s economic healing, allowing Potawatomi children to have a bright future. The Prairie Band Potawatomi work closely with surrounding communities to create jobs and spurring economic development throughout the region. While Europeans brought new games to America, Indian gaming existed long before Europeans settled in America. Large-scale Indian gaming, mainly bingo, predated IGRA by about 10 years. In 1987, the U.S. Supreme Court recognized Indian gaming rights when it ruled states had no authority to regulate gaming on Indian land, if such gaming was permitted outside the reservation for any other purpose (California v. Cabazon). Congress established the legal basis for this right when it passed IGRA in 1988. IGRA requires all tribal gaming revenues to be used solely for governmental or charitable purposes. Just as state governments decide the fate of funds from over 40 state-run lotteries, tribal governments determine how gaming proceeds are spent. Indian tribes use gaming revenues to build houses, schools, roads, sewer and water systems; to fund the health care and education of their people; and to develop a strong, diverse future economic base. Tribal governments safeguard projects they rely upon for food, clothing and education. Prior to the IGRA’s federal gaming regulation framework, tribes self-regulated gaming using inherent police powers. Existing tribal law enforcement and court systems have been in place for years. Tribal-state compacts ensure law enforcement and security measures are considered. On the federal level, the Department of Justice, FBI, and Bureau of Indian Affairs oversee crimes committed on Indian reservations. The IGRA established the National Indian Gaming Commission to regulate Indian Gaming in February 1993. All Indian people pay federal income, FICA, and social security taxes. Most Indians also pay state income and property taxes. Only the small percentage of Indians living and working on federally recognized reservations, not unlike soldiers and their families living on military installations, are exempt from paying state income and property taxes. However, taxes such as sales tax and federal income tax are still paid. Indian tribes are governments with responsibilities to their citizens, but tribes usually lack a tax base to support their governmental needs. Some tribes have found in gaming a means to not only provide jobs and economic activity on their reservations, but also a source of badly needed government revenue. Just as states do not pay taxes on resources derived from gaming, neither do tribes. IGRA is working to the benefit of Indians and non-Indians in several states, including Minnesota, Wisconsin, Michigan, Connecticut and Kansas. Reservations are slowly recovering from decades of failed government programs, rebuilding houses, community centers, and roads. Indians and non-Indians are proudly replacing welfare rolls with payrolls. Local and state governments are enjoying increased tax revenues. Only in those states failing to negotiate “good faith” compacts, in violation of IGRA, has the process not worked. The states’ ongoing assault on IGRA rests on the false premise states possess inherent rights to regulate tribal gaming. States initially proposed and accepted the IGRA, passed by Congress in 1988, but now assert the IGRA violates the 10th and 11th Amendments to the U.S. Constitution. To the contrary, the Supreme Court’s Cabazon decision was a clear recognition of the right of Indian tribes to regulate gaming on their lands free of state laws if the state permitted those activities outside the reservation. Indian gaming is now a $5 billion industry according to Gaming & Wagering Magazine. Indian gaming creates jobs, increases economic activity and generates tax revenue both on and off the reservation. In San Diego County, California alone, tribal gaming has been responsible for the creation of more than 5,000 well-paying new jobs, with a payroll of $22 million per year. Tribes have spent millions of dollars for construction, and spend much more locally for goods and services. Many reservations are located on remote, undesirable land. Prior to the introduction of tribal gaming, reservations had witnessed minimal public or private-sector economic development. The Bureau of Indian Affairs has proved unsuccessful in implementing successful economic reservation development, and states have failed to propose credible alternatives to Indian gaming for tribal revenues and jobs. Tribal governments are using gaming proceeds to diversify and conduct other economic enterprises. Public opinion surveys, both nationally and within various tribes, conclusively demonstrate strong public support for expanding Indian reservation gaming. A national Harris Poll in October 1992, and polls in Arizona, California, Kansas, Minnesota, New Mexico, Nebraska and Washington, all show the general public favors casino-style gambling on Indian lands, while opposing non-Indian gaming expansion. Indian gaming is supported by voters because revenues help tribes and surrounding communities become economically self-sufficient. Note: While federal and state governments rely on taxes to generate program funding, American Indian governments must rely on their business acumen. Whereas the federal government can operate with a deficit budget, Indian tribes must carefully manage all resources assuming sound financial operation. Tribal governments do not tax their citizens or the businesses located on reservation lands. Alternate economic programs have been created to fund tribal business/government operations. Gaming is only one vehicle used to generate revenue for funding tribal government operations and responsibilities, such as: health and welfare, education, fire and law enforcement, cultural programs and child care facilities.